You all know that I have a small (okay fairly large) obsession with off-the-shoulder tops. So when I saw this sweater from the Treasure & Bond x Something Navy collaboration, I needed it in my closet right away. Not only am I obsessed with the shoulder baring cut, but the slight balloon sleeves add a unique touch. The best part about this, and most other off-the-shoulder sweaters, is that it can be worn both off-the-shoulder and as a cowl neck. It's like getting two sweaters for one, and also the perfect item to take you from the office to after work drinks. The bad news, is that this sweater is currently sold out. I did, however, search high and low, and rounded up some great off-the-shoulder options, which are all linked below. Another thing that I'm excited to share with you are these jeans. I bought them back in May, in a size smaller than what I typically wear, since they're super stretchy. Well, do to unhealthy snacking and overindulging during the holidays, lets just say that I haven't been able to button them for a while. However, now that I've been following the 80 Day Obsession for the past three weeks, including the specific meal plan, not only have I lost the extra holiday weight, but my skinny jeans fit like a glove! The program lasts for 80 days, and since I'm almost through the first phase, I'm thinking about giving a fitness update, including some information about the program and my nutrition. Everything that I eat is clean, and my meals are simple to prepare. Let me know if this is something that you would like me to share. Oh yeah, and if you're looking for a great denim line that's affordable, I've been pretty impressed with this brand! 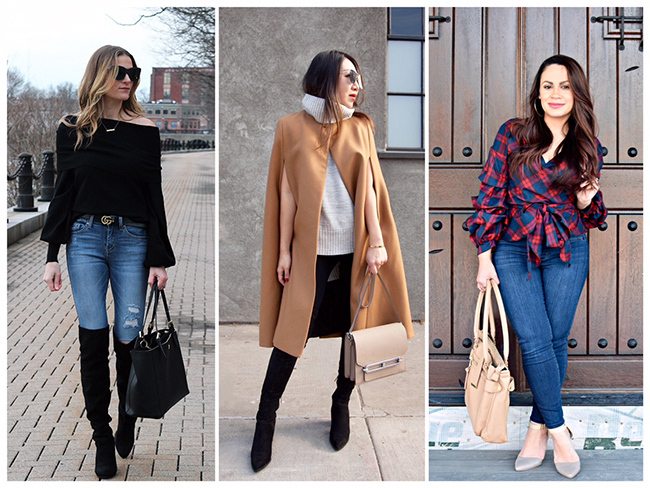 On a final note, my OTK boots, which make the perfect Stuart Weitzman dupes, are on sale! They're currently marked down to $65, plus there is an additional 25% off, making them under $50! But hurry, the addition 25% ends February 4th. The feature blogger is Brandi of Brandi K's Dose of Inspiration. I'm loving how she styled this pom pom sweater! Make sure to stop by her blog and say hello! I love the lantern sleeves. They are so unique and really makes a difference! I really think that the versatility of this top makes it a must have! Love this whole outfit - especially those OTK boots. I really need to buy a pair but having just returned from a long holiday to the US, I need to save up first lol!! This is such a classic look Rach, love this sweater. A beautiful off the shoulder sweater in this very classy outfit! This look is so you! Great photos! Have a good weekend! Aww, I wish that sweater wasn't sold out! I must have it!! I love the off-shoulder detail, but the sleeves really make it a WOW piece. You look fab! You look amazing! Love that top and your OTK boots. Such a great sweater, Rachael! I love that you have the option of wearing it off the shoulder or on. And you are looking quite sassy in this outfit, my friend! Well done! Have a fabulous weekend. You look adorable in OTS tops, I can see why you love them so much! I love that pair of denim on you, too... hugs you in all the right places! The OTK boots look fab with them! Your OTS top with that denim and belt looks perfect. Great look. Loving everything about today's look! Can I just have your entire closet, please? I'm all about convertible pieces! This is a big win in my book! You look fabulous, momma! I'd love to hear about your fitness journey! This whole outfit is so chic! I love this outfit! It looks so cute and I love it paired with that belt and the OTK boots! Such a cozy classic look! I love how you styled it with the boots! Love love love this look. And the sweater is fabulous...those sleeves!!! I love that cute sweater! It looks great on you! I love this look! Classy and cute! off shoulder sweater is so cute! Oh I love this sweater! I especially love that it can be worn as a cowl neck or off the shoulder. I would love to hear about the 80 day obsession! I absolutely adore the off the shoulder trend too, and those sleeves make the sweater even more attractive! Thanks for sharing! You look so chic & classy. Those boots are the perfect fit for you. I am loving this look babe!! SO chic and I love this top! Okay this is sooo classic! Love a good black based outfit! Those boots too! Such a gorgeous top! I love this look. I love that this can be worn both ways! I always struggle with ots because I wear most things either to work or with Ivy which makes ots not that practical even though I love it. Love this sweater!! Really cute with these otk boots!! I absolutely adore pieces that can be worn multiple ways. This one in particular would suit me since I'm not a fan of OTS tops on myself. I love the way they look but they NEVER stay on me haha! Such a cute outfit! Love that sweater! That sweater is so cute! I love the balloon sleeves! This sweater with those boots is the perfect weekend outfit! LOVE! I love that you can wear this two ways! I would have never known that this was the same sweater! I would totally buy this because it is so versatile! I love this sweater!! Looks so cute both ways! I absolutely loveee this sweater! The off the shoulder look is so cute! I love this off the shoulder sweater. The sleeves are so cute! The outfit is classic, but very chic! I love how versatile that sweater is and how it can be worn in two ways. You really can't go wrong with matching sweater and OTK boots, lovely the elegance and simplicity of black. And you're definitely rocking it dear! such a great wardrobe staple, I love the OTS detail!